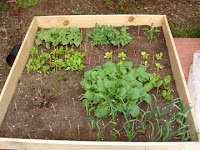 Although I'm not planting anything new this weekend (so far), I thought I'd share a picture of one of my raised beds. I've had requests of pictures of how things are growing so here's the most active one so far. It's 4' x 4'. For more details on variety, see the sidebar "In the garden". The weather should be nice enough for almost everyone now, so what are you guys planting this week? We are so behind here. First the late season blizzard, then the rain, tornadoes and rain again, I am just now getting my warm weather plants in. So today I will plant everything that I can. Very new to the gardening scene - but am going to attempt to transplant some tomatoes and peppers purchased from the farmer's market. I don't know if the seeds I put in last week in my lovely new garden plot will survive - we had 7 inches of rain in the 2 days afterwards. Who knew that would happen!?! I am going to do a few pots for the deck and transplant my tiny tomato seedlings to a larger pot. Other than that, I am patiently awaiting more perennial action! Do you participate in Garden Blogger's Bloom Day? I will this month - finally! Looking good, we had a big saturday for planting around our place, added a bunch of peppers and some cantalopes to the beds. I posted a pretty good garden update last night as a matter of fact with some pictures of my beds. I've also got beans, squash, pupkins and corn sprouting but you can't see them yet. Getting ready for the garden goodies... mmm mmm good! CC, I forgot to mention, I can see your sticks poking out, how's that working for you? qt - I have participated once in Garden Blogger's Bloom Day, but I keep forgetting or don't have time to do it justice. p~ - the Hanoi Hilton is working out rather nicely. Except there was one spot where the sticks had popped out with the row cover so a cat made itself at home. I know this because everything was squashed and looked kinda cooked in that area. I moved some other sticks to fill the spot and noticed one of them had some kitty fluff stuck to the end.